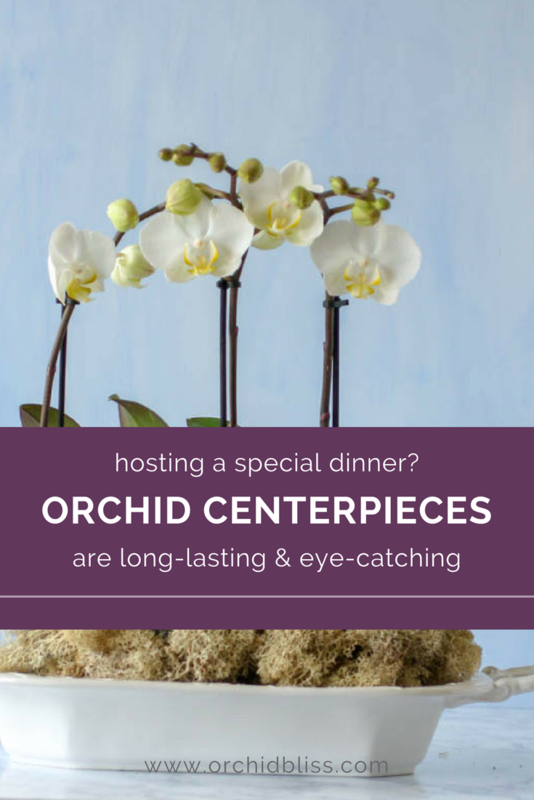 Orchid Centerpieces are long-lasting and come together in a flash. 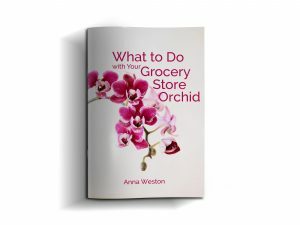 Get ready to make your orchids work for you by designing a professional-looking orchid display. 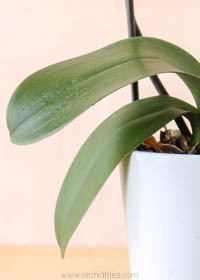 Especially if your’e an orchid grower, you may have a few orchids in bloom that are begging for you to show them off. Or, you may have an up-coming dinner or special occasion and you’d like to use orchids in your centerpiece. I’m in complete agreement with you. Please note: I may receive a commission if you purchase through these links. Let’s talk about what makes a successful centerpieces, some suggestions for containers for centerpieces, and, finally, let’s put some centerpieces together. Container. See the options above for ideas. Orchids. Groups of 3 look nice, though sometimes it only takes one. 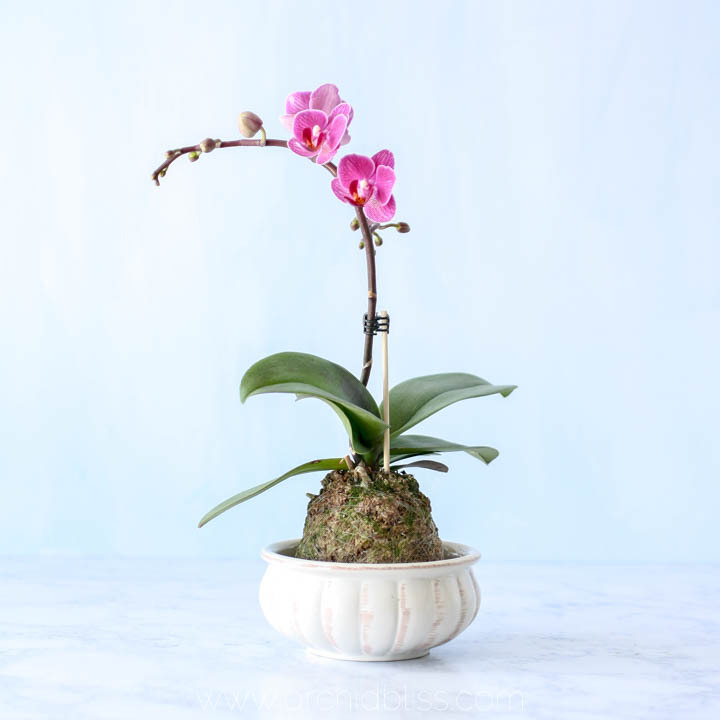 This Etsy Shop, Floralistic, delivers mini Phalaenopsis orchids in both 3 inch pots and mini Phalaenopsis orchids in 2 inch pots. 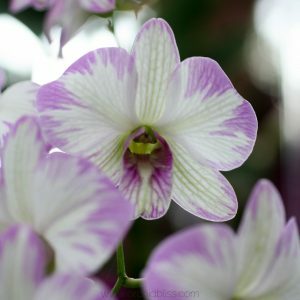 You select the quantity and color of your orchids. Reindeer Moss. I love this top dressing. It’s soft and squishy, easy to use. If your centerpiece is large, you may need more than one bag. It comes is a multitude of colors. Air plants. 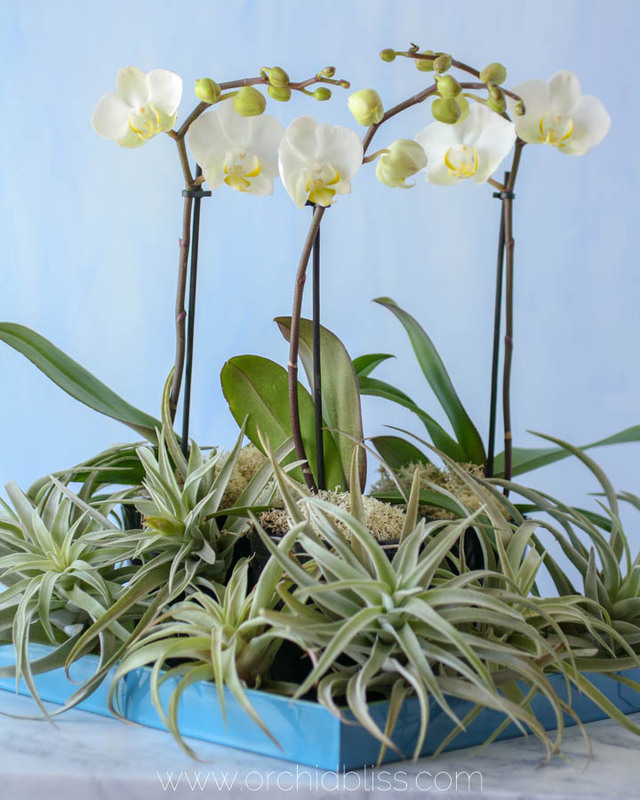 Without pots or soil, air plants are an easy choice for finishing off your orchid centerpiece. A few popular examples are T. xerographica, T. tricolor v melanocrater and T. peach capitata. 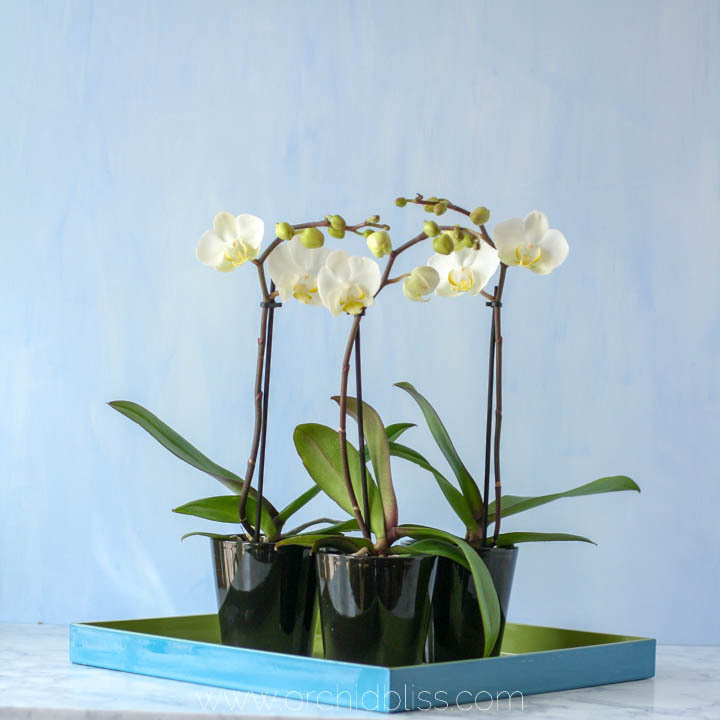 This ceramic serving dish is just the right size to hold three mini Phalaenopsis orchids. Topped with reindeer moss, this display will last for several months. 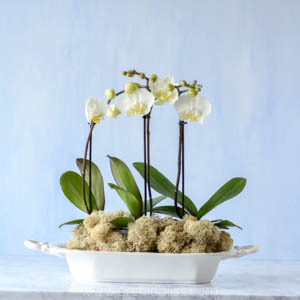 This narrow serving dish for three mini Phalaneopsis orchids. 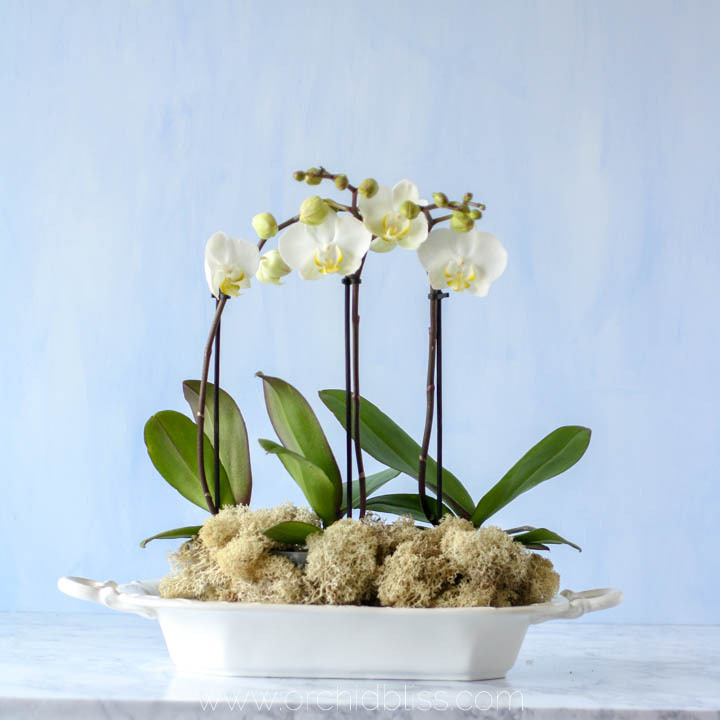 After setting the orchids in the dish, cover the base of the orchids with reindeer moss. 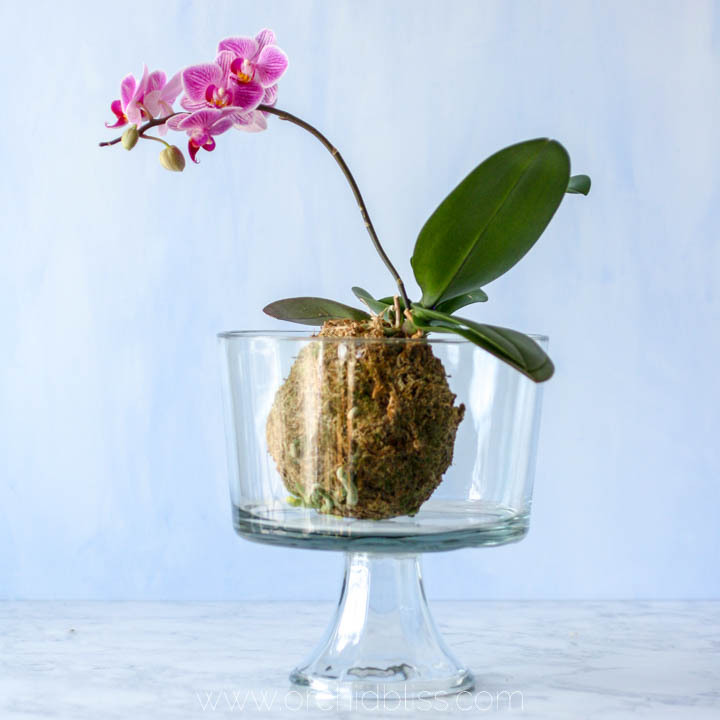 This orchid kokedama centerpiece displayed in a trifle dish looks great from every angle. 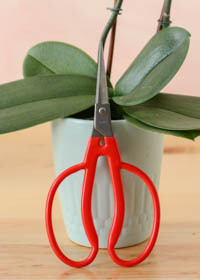 The slender orchid and glass container does not impede guests from seeing each other across the table. Keep it simple. Sometimes just grouping the orchids on a tray is enough. If you want to dress up your design, a simple way to do that is to add air plants. No potting or dirt is required with air plants. These air plants, T. melanocrater v tricolor show off red flowers. What could be easier? To add a little polish, top the orchid pots with a bit of preserved reindeer moss. For an alternate view, use another variety of air plants. Pictured above T. peach capitata. This mini orchid couldn’t be simpler, or more colorful. The vibrant magenta flowers contrast with the robin egg blue ceramic pot. A touch of purple reindeer moss highlights the flowers. 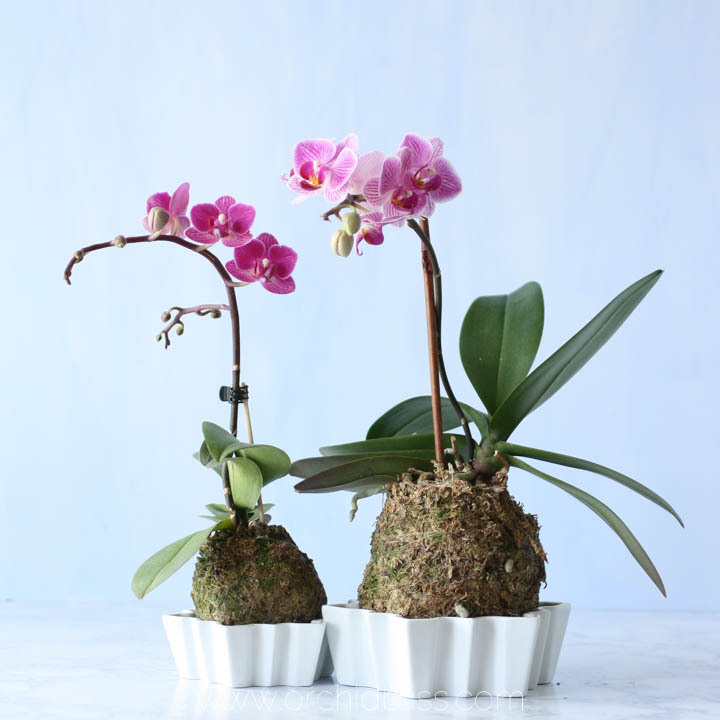 A study on simplicity are these two kokedama orchid set in uniquely shaped dishes. 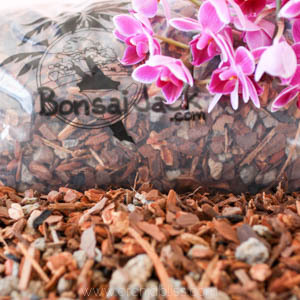 Tip: If you are using kokedama, fill the bottom with a shallow layer of gravel to stabilize the orchids. Just a bit of gravel in the bottom of your dish will keep your kokedama upright and secure. Safe and secure this kokedama orchids regally sits in its pot. 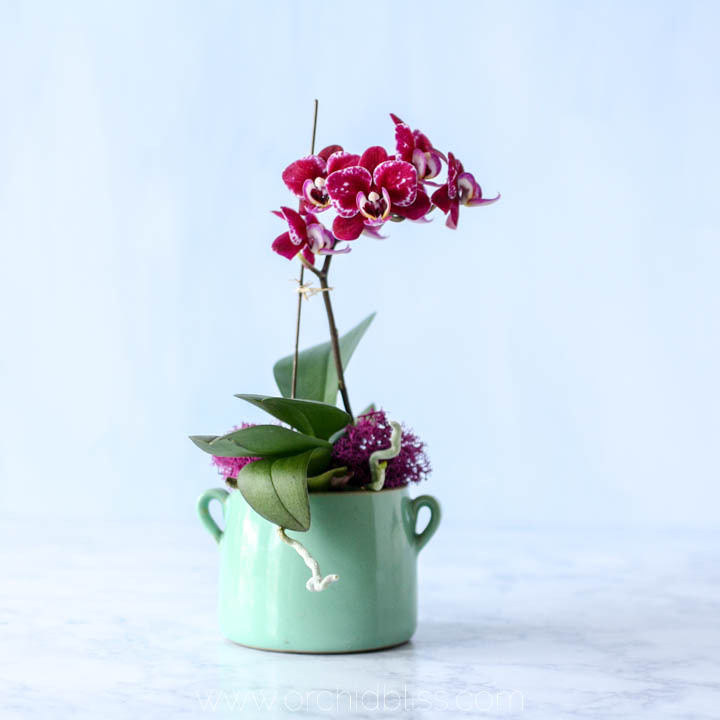 When designing your orchid centerpieces, keep in mind these three things: First, orchids are ideal because you can purchase and get them ready WAY in advance and you won’t have to worry about the flowers fading. You can put these together weeks before your event and they will only improve as more flowers open. Second, remember that the centerpiece should facilitate, not detract from conversation. (That’s why I like mini orchids; they aren’t too tall.) And, third, be sure the centerpiece looks good from every direction. With these things in mind, your centerpieces are sure to be a hit. 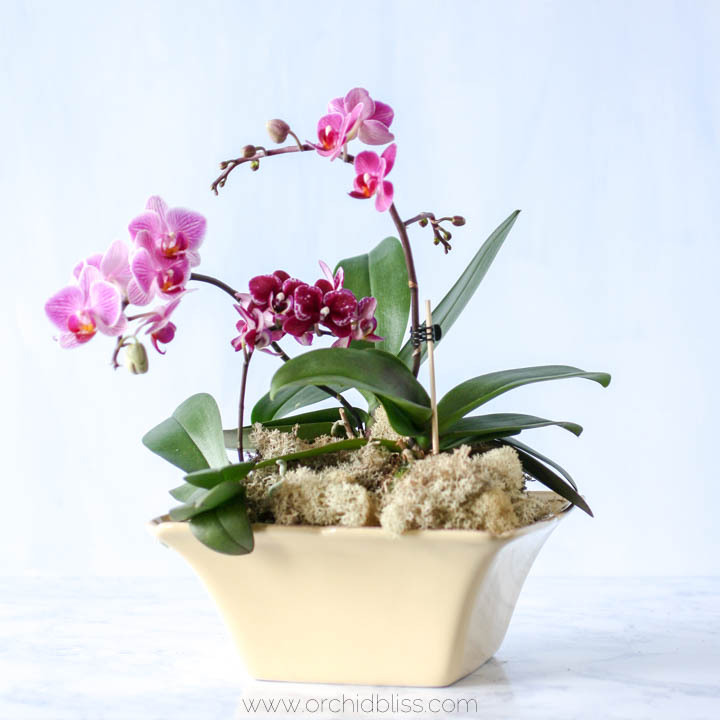 Orchid flowers tend to be long-lasting by nature and they are definitely eye-catching. This was a lovely post. You have inspired me. Thank you thank you Cheryl for your kind words! You beautiful displays of orchids. Just love it. Thank you. 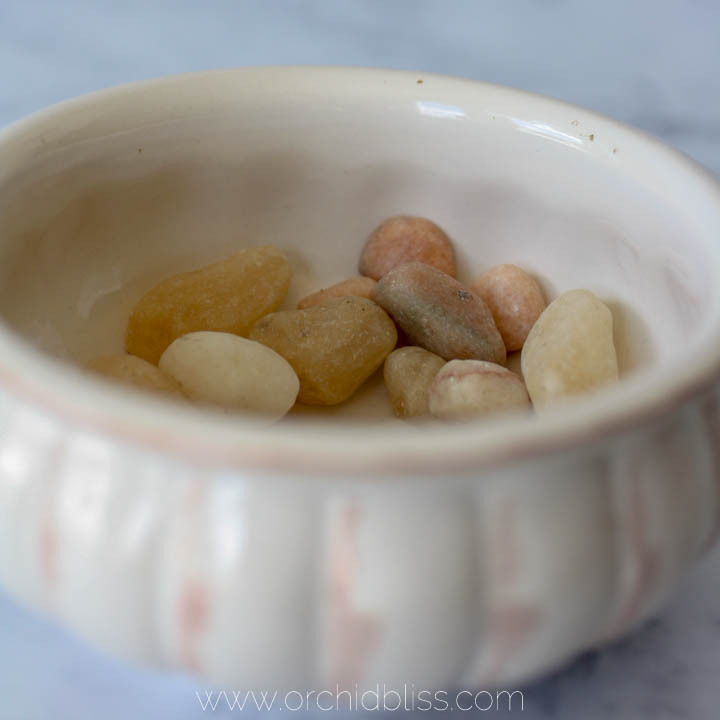 In this post you’ve highlighted what I really love about orchids: their gorgeous simplicity. I especially love the arrangements with air plants and the kokedamas. These centerpieces truly are a cinch to put together and look amazing. 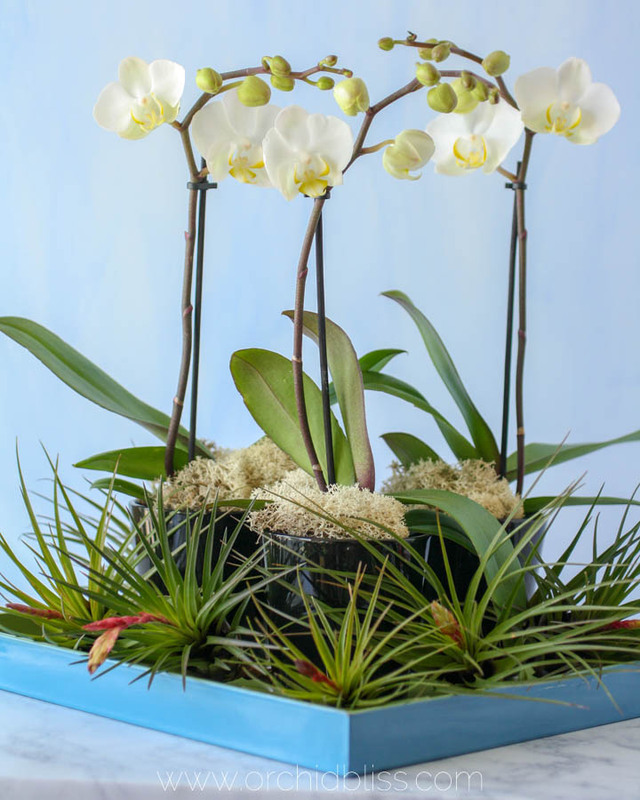 I couldn’t agree more – the simplicity of the arrangements brings out the natural elegance and beauty of the orchids. 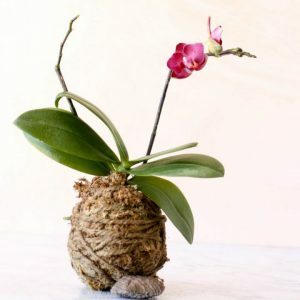 I’ve had A LOT of success with my phalaenopsis orchid potted kokedama style. They seem to really like it. The secret is the wiffle ball in the center that keeps the moss ball from holding too much water.